The YKK-sponsored Widnes Wild have a tough weekend ahead of them with a trip to Hull to face the Jets on Saturday night and then the visit of the Coventry NIHL Blaze to Planet Ice Widnes on Sunday. The Wild beat Hull 3-1 last Sunday in an incredibly tense and close game that could have gone either way and, with the Jets having won the only other encounter between the two teams this season – 4-2 on Humberside back in October, the two rivals are locked together on one win each and 5 goals each so far in the series of four games between them. The win last Sunday was the Wild’s 9th in a row but with the Jets being one of only two teams to have notched up league wins against Widnes this season, the game at Hull will be another tough test. 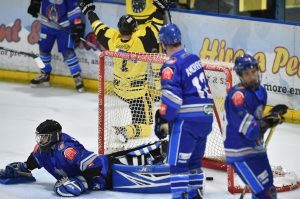 On Sunday they entertain the Coventry NIHL Blaze who always seem to play well but have trouble winning games. The Wild have beaten the Blaze twice this season already – 8-0 away in October and then 7-2 at home on Remembrance Sunday. Coventry trounced the Altrincham Aces 10-1 in their last game but have only won 5 matches overall out of 13 starts this season and they currently sit 3rd from bottom of the Laidler table. The game on Sunday also sees the club’s annual Christmas “Teddy Toss” event where supporters are invited to bring along soft toys which will be thrown onto the ice at a specific point in the game and gathered up to be given to sick children who will be in hospital over the Christmas period, and other worthy causes. Because they will come into contact with the ice surface (which is wet…), fans are asked to make sure that their soft toys are wrapped up in plastic so that they don’t get damaged, otherwise they can’t be used. For health and safety reasons, toys must be new but, last year, any toys that were damaged or unsuitable to be given to children were taken to the dogs’ home – so nothing went to waste!